Ol Pejeta has built a sanctuary for orphaned chimpanzees. The chimpanzees all have harrowing stories but now live in two large family groups. 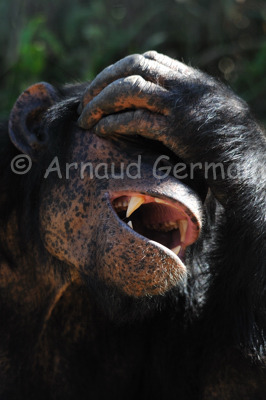 They are the only chimpanzees in Kenya. The enclosures allow the chimps to live a semi wild environment. It was very interesting to listen to the stories and be able to approach them very close (with a fence between us!). Oscar was born at Ol Pejeta and has become the dominant male of his group. He always pulls funny faces.